You have many choices when you go to the movies in New York City. This cinematic city surely shows all of the silver screen's latest hits in cutting-edge movie theaters but look closer and you'll discover that the city offers a great selection of independent movie theaters, too. Here are nine of the best independent movie theaters in Manhattan, where you can catch an interesting flick in a cinema oozing with character and off-the-radar appeal. Set within an old Yiddish vaudeville theater, dating to 1898, this Lower East Side multiplex offers five state-of-the-art screens dedicated primarily to first-run independent and foreign films, including midnight showings. Expect stadium seating, Dolby Digital Surround EX sound, and gourmet concessions, as well as more unexpected attractions like a Japanese rock garden and third-floor viewing bridge touting city views. 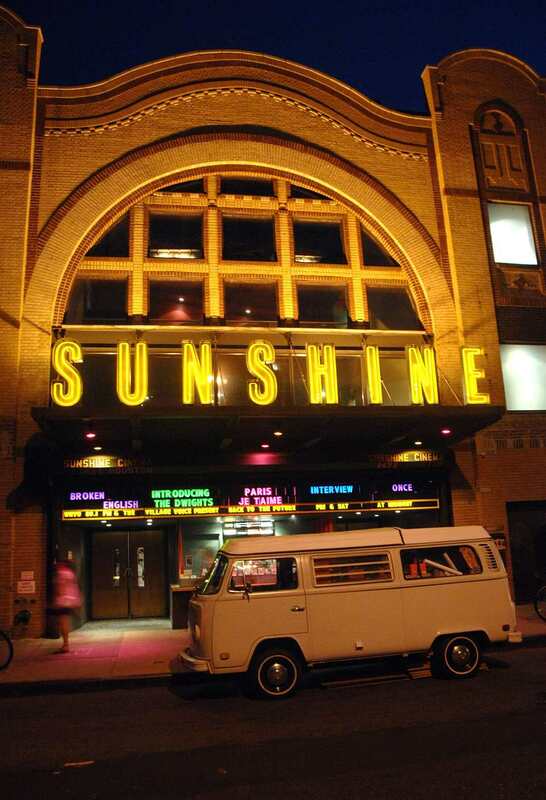 Landmark Sunshine Cinema, 143 E. Houston St., between 1st and 2nd Avenues. A nonprofit cinema since 1970, this legendary staple on the indie cinema circuit is a go-to for independent premieres and repertory programming. The three-screen Manhattan movie house is open 365 days a year and showcases two complementary film programs, including NYC premieres of American independents and foreign art films, as well as curated repertory selections. Film Forum, 209 W. Houston St., between 6th Avenue and Varick Street. Set within the historic Waverly Theater, this temple to independent film offers five top-notch cinemas that screen independent, foreign, and documentary features, as well as special showings of classics and midnight cult movies on the weekends. Look, too, for short film screenings ahead of every feature. IFC Center, 323 6th Ave. at W. 3rd Sreet. Set in SoHo since 1989, this indie cinema standby programs a robust selection of indie and foreign films (along with some box office hits). The sophisticated space is a must among indie movie theaters in Manhattan and has a popular gourmet café, too. Angelika Film Center, 18 W. Houston St., between Mercer St. and Broadway. This museum-minded center, established in 1970, comes dedicated to "the preservation, study, and exhibition of film and video, with a particular focus on independent, experimental, and avant-garde cinema." Apart from an inventive and diverse film program, it lays claim to the world's largest reference library devoted to avant-garde cinema. Anthology Film Archives, 32 2nd Ave. at 2nd Street. This Midtown single-screen movie theater specializes in original-language foreign films (especially French cinema), and other indie and classic films. Dating to the 1940s (Marlene Dietrich cut the opening ribbon here), the elegant gem of a theater is today operated by City Cinemas and is often used for film premieres. Paris Theater, 4 W. 58th St., between 5th & 6th Avenues. Dating to 1972, this small yet longstanding indie cinema in Greenwich Village shows independent features, documentaries, and foreign films. The theater offers organic wines, craft beer, and light refreshments. Happy Hour is from 5-8 p.m. on Wednesday through Friday ($2 off wine and beer). The Quad Cinema, 34 W. 13th St., between 5th and 6th Avenues. Showing a mix of indie and mainstream films, Lincoln Center's in-house theaters are state of the art, with a generous year-round calendar of programming. Billed as "America’s preeminent film presentation organization," the Film Society of Lincoln Center was founded in 1969, and today hosts two major film festivals, the New York Film Festival, and New Directors/New Films. Film Society at the Walter Reade Theatre at 165 W. 65th St., between Broadway and Amsterdam Avenue. Set up in an old fire station dating to the 1890s, the humble Cinema Village opened in the mid-'60s and is one of the oldest continuously operated art cinemas in the city. Come to see American indie sleepers, revivals, film festivals, Japanese/Hong Kong cinema, and even animation compilations at this longstanding favorite among Manhattan movie theaters. Cinema Village, 22 E. 12th St., between 5th Ave and University Place.